LikeTelevision Premium Members have access to the Image Download Library which contains over 12,000 HIGH RESOLUTION images, including multi-layered PSDs, TGAs, JPEGs and GIFs! The Image Download Library is very easy to use! Each video page on LikeTelevision contains a link to the Image Download Library! (not available for all titles) Each week as we add more streaming videos, we'll also provide links to that video's Hi-Rez images! 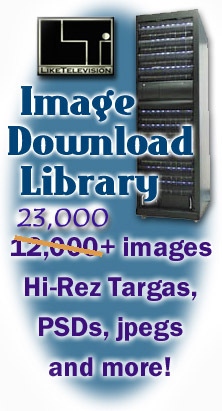 Access to the Image Download Library is available to Premium Members Only! Premium Quality - HUGE files! New Images Added Each Week!